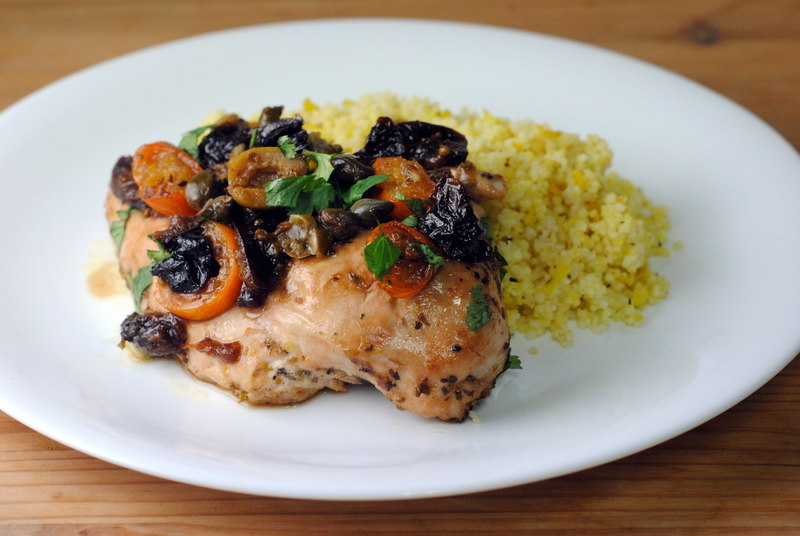 An invention of the 1982 Silver Palate Cookbook, Chicken Marbella has been a perennial dinner party favorite ever since. For those unfamiliar, the dish is a startlingly good combination of olives, capers, prunes, oregano, garlic, red wine vinegar, brown sugar, and white wine. I have long thought that citrus would make an excellent addition to this already fun play on briny and sweet. 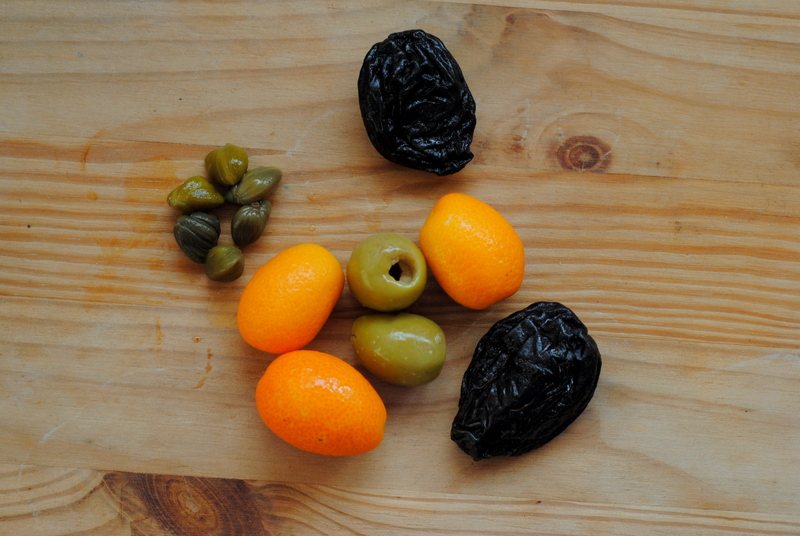 When I saw baskets of kumquats perfectly in season at the shuk I knew they’d be a match made in heaven. I was right. In addition to adding sliced kumquats to the mix, I also added grated lemon zest for extra zing. The original recipe makes enough for 10 to 12 servings, and I’m still waiting for the day when I have an apartment large enough to host a dinner party of that size. So I cut it down to a more manageable 4 to 6 servings. The recipe is really very forgiving, so feel free to adjust based on how many people you are feeding and your personal preference. I also (gasp) used large whole chicken breasts in place of the traditional mixed chicken pieces. Again, the recipe is forgiving, so use whatever cuts of chicken suit you. Finally, in the original recipe they stress how important it is to marinade the chicken overnight. Well, I was a little short on time. But 30 (it may have even been 20) minutes in the fridge and the chicken was still unbelievably delicious. Like lick your fingers, and plate, and pan delicious. I served this with couscous, which was just right. 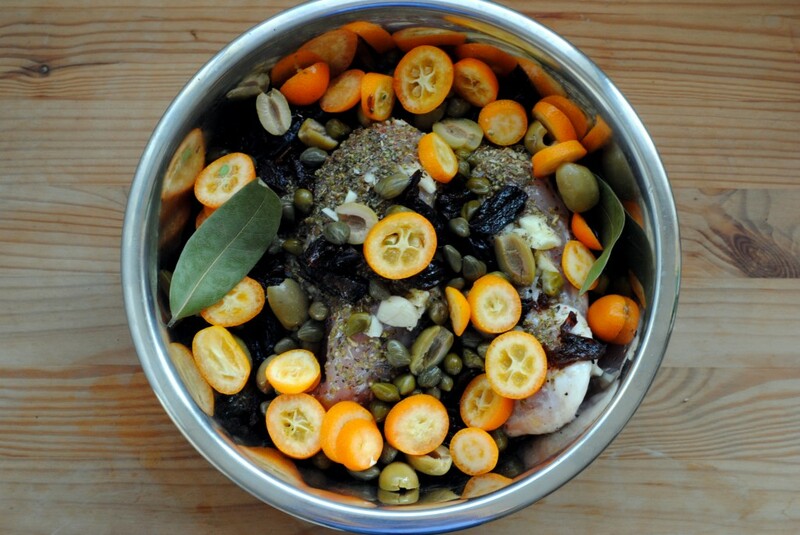 In a large bowl combine the chicken, garlic, oregano, red wine vinegar, olive oil, prunes, olives, capers and liquid, kumquats, lemon zest, and bay leaves. Season with salt and pepper. Cover tightly with plastic wrap and refrigerate at least half an hour, preferably overnight. Preheat the oven to 350F. 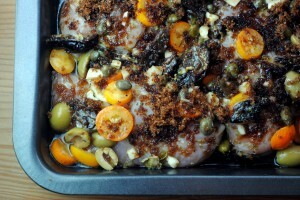 Arrange the chicken in a single layer in a baking dish. Spoon marinade over evenly. Sprinkle chicken with brown sugar and pour wine around. Bake for 40 minutes to 1 hour, basting frequently (depends on the cut of chicken – it took about 40 minutes for the chicken breasts to cook). Using a slotted spoon, transfer the chicken, prunes, olives, capers, and kumquats to a serving platter. Spoon a bit of the pan juices over and garnish with the parsley or cilantro. Transfer the pan juices to a sauce boat and pass.